This year has been crazy so far. In a good way, of course. I’ve set a goal for myself to run 365 miles this year and to make better life choices. And so far, I’ve been succeeding. I’ve ran a third of my goal so far, been eating way healthier than ever before, and have lost 15 pounds since the first of the year. I’ve even been going to the gym at least five days a week or making sure I do something active those days. The weight loss has been accidental, it wasn’t intended, but merely a reflection of how much my body needed to change. Exercise and good food makes all the difference. That’s where today’s meal comes in. You don’t have to eat bland food or cut out fats to be healthy. You just have to recognize portions, make good choices and don’t be afraid of vegetables. Really, don’t be afraid of vegetables. For the most part, they have little to no calories and if you eat enough of them, you’ll get full and not crave more food. When I had this burger craving, I opted to get ground chicken instead of ground beef thinking it would be a healthier choice. 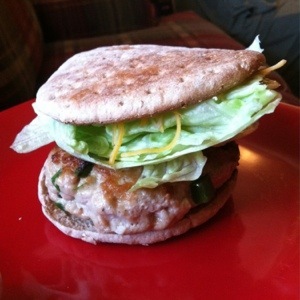 For one burger, I used a little less than a quarter of pound of ground chicken and mixed in a third of a diced jalapeno, a teaspoon of ground pepper, and 2 teaspoons of garlic powder. Form the patty and grill in a pan until cooked through, about six minutes a side. I used a toasted Arnold’s Flatbread as my bun and topped the burger with a sprinkle of shredded cheddar cheese and iceberg lettuce. Delicious and totaled about 300 calories. Not bad for a lunchtime meal and chicken burgers.